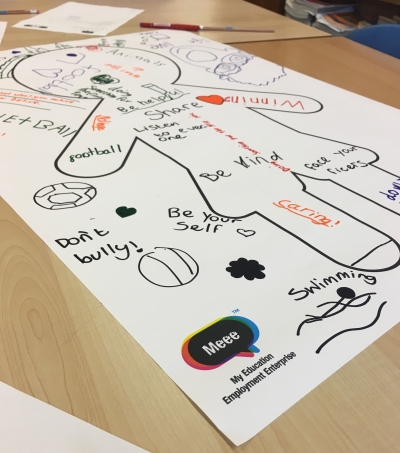 Sid and Tia recently ventured to Saltney where they delivered three brilliant sessions about building resilience, embracing difference and encouraging inclusion to three groups of students aged 7-11. After receiving a truly warm welcome from the students, we explored what it is to single someone out because of their differences and how as a society, we feel the need to give everyone and everything a label. The young people of St Anthonys came to realise that we don't all fit one perfect mould which encouraged them to be proud of who they are as individuals. Each student had the chance, through our exercises, to explore themselves including both their strengths and their weaknesses. They recognised and embraced their perceived imperfections as well as celebrate those things they excelled at. It was truly inspiring to see them all share information about themselves that they previously never have. Sid: “It’s wonderful to see how such a small amount of time can have such huge benefits. Children rock!" We had a truly wonderful time working with the students in St Anthonys. We shared stories, laughs and wishes for the future. But most of all, the students learnt that though we are different - it's all about what makes us, us - we are all wonderfully unique and that is a thing that should be celebrated. You can discover more about our Meee Education workshops here! Or get in touch with us via info@meee.global to discuss bespoke programme or for more information. "Control your own destiny or someone else will"